I have two posts in the making, but must finish this one first as the end of the month is looming and I want to get my “seasonal foods for August” piece published before September shoves its way into my life. What’s the deal with these pushy months, anyway? How could September and Labor Day be upon us already? I’ll follow this post in a few days with one wrapping up my wilderness journey along the Colorado Trail. But first, I’m still in a tizzy over Denver being showcased during the Democratic National Convention. Don’t believe half of what you read about protesters taking over the city. Things were mellow. Recreate ’68 fizzled out and never left the ground. Much like the protesters’ attempts at levitating the Denver Mint. Armed with magic mojo (their words, not mine), a small group of protesters joined mental forces, held hands, and collectively tried to levitate the mint, shake that money-maker, and liberate the $50 million dollars it held hostage. Wizard-attired spokesman, Yippie Pie Man, who came in from out of town (whew, glad he’s not a local), lead the mint-raising rally and encouraged bystanders to contribute their personal energies in redistributing the loose change garnered from the shake down. Needless to say, their mass brain power was tenuous at best, the mojo wasn’t magic, and the Mint never budged. Enough of that — on to what’s in season. Fruits and veggies, not politics, however entertaining the political scene may be right now. In my next blog life, I’m going to be a political wonkette. Middle of the road and unbiased, of course. Just the facts. For now I’ll stick to food. I’ve focused on tomatoes before, so rather than repeat myself, please go here for relevant nutritional information. Aside from being versatile, luscious, juicy, and colorful, tomatoes promote healthy immune function and have anti-inflammatory properties — both of which are important if you have celiac disease. Or, any other health issues for that matter. Or, if you’re perfectly healthy and you simply want to stay that way. tomato tip — Carotenoids are the source of vitamin A activity in tomatoes and are also responsible for the red-hot color. Beta-carotene and lycopene are the most talked-about carotenoids in tomatoes. They are also fat-soluble plant chemicals, so you’ll get more bang for your carotenoid buck if you add a touch of olive oil to the mix. Oh my gosh, Colorado peaches are the best! Hopefully no one from Georgia is reading this blog. I imagine they would beg to differ, but if you’ve ever tasted a Palisade Peach, you’ll understand what I mean. As some of you know, I belong to a local, organic CSA and have been reaping the veggie benefits all summer long. Last week the farm started shipping out the fruit shares as well. Nine plump, ripe and absolutely gorgeous peaches were included in my box. I made fresh peach cobbler, which was so good I ate what was leftover the next morning for breakfast. Here’s my recipe for gluten-free strawberry/rhubarb crumble tart (or something like that). All I did was substitute the nine peaches for the strawberries and rhubarb, baked it, put a big glob of warm cobbler on my plate, and topped it off with some vanilla ice cream. Well, you’ll just have to experience this bit of food heaven for yourself. It’s too good to describe, so give the recipe a try — this time with peaches. Yum! This nutrient-dense plant should probably be called Greek chard as it was Aristotle who in the 4th century BC wrote about its health-promoting benefits. How did he know all that stuff back then? The guy had a very diverse resume. Although there are several different varieties of chard, all are basically tall, green, leafy plants with crunchy stems. All versions are low in calories, high in nutritional value, and full of hearty taste. Some people find this full-bodied flavor a bit much, but I like the taste and the texture. Similar to spinach, kale, and collard greens, chard is rich in vitamins A, C, E, and K and an excellent source of magnesium, potassium, iron and fiber. It is also a good source of osteocalin, which promotes bone health. And yes, we all want strong bones! Related to both the melon and the cucumber, summer squash has a tender center, lots of seeds, and edible flowers called squash blossoms. Like chard, there are several different varieties, but most have similar cooking qualities and all are fairly mellow in flavor. Squash is an excellent source of vitamin C and A, manganese, magnesium, potassium, and fiber. Plus, you can do anything with squash — from basic steaming to bread making. Those great big, overly mature squashes (the kind people try to pawn off on you) have stringy centers and aren’t nearly as tasty as the smaller versions. I like using chunks of squash in garden enchiladas with blue corn tortillas. Although corn, cantaloupe, and eggplants are in season right now as well, I’ll spare you more nutritional talk. For now, anyway. This entry was posted on Saturday, August 30th, 2008 at 1:25 pm	and is filed under Seasonal Foods. You can follow any responses to this entry through the RSS 2.0 feed. You can leave a response, or trackback from your own site. But seriously, I guess you can have them now; our peach season is over here! Sally — I’m not surprised you’re from Georgia. You totally look like a Georgia peach in your current blog photo! Must be that gorgeous hair of yours. Our growing season starts a little later than yours. We have snow into May and sometimes June. Or August in the high country, of which I can attest to! Oh glorious peaches!! Oh how I miss Palisade peaches!!! Those are soooo pretty (even if they aren’t from Palisade…though those are the best!)!! Whew…I’m glad Yippie Pie Man isn’t from Grand Junction – we only had Speedo Man who rolled around on his rollerblades in a speedo all year long and never tried to raise any buildings! Really? Colorado peaches are that amazing? Well, then I’ve got to make sure I have some next time I visit. I just love eating local produce in different parts of the country. And don’t worry, I’m not from Georgia. M:Loved reading about the hike and those peaches look wonderful. We had some great ones this summer in NC, but alas, they’re gone. You’re an inspiration. 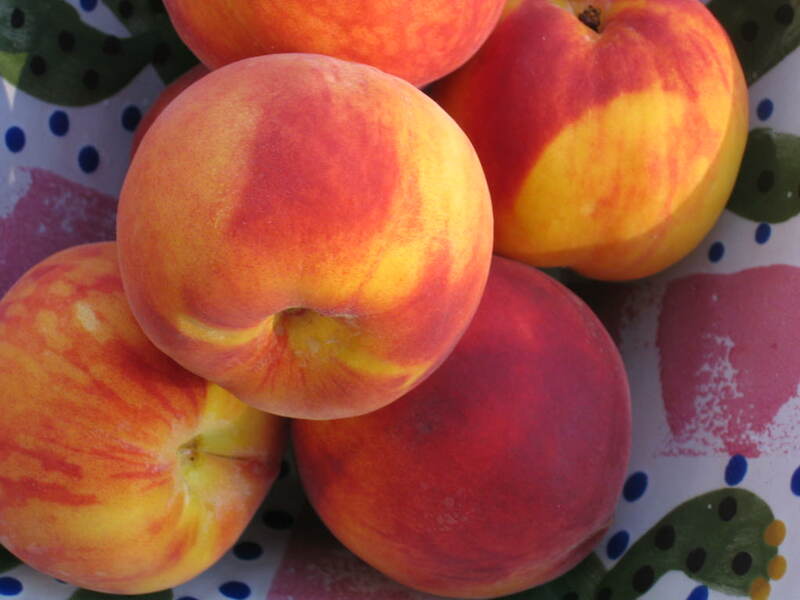 Hey Michelle — first off, you should know about Palisade peaches being from the Western Slope! Second, I LOVE the look, feel, and content of your updated blog. Nice Hawaiian-style direction you’re going with it! Beautiful photos as well. And third, I haven’t forgotten the “Tag, You’re It” post you did back in July and now that I’m transitioning back to “real” (unreal?) life, I’ll get to the meme you tagged me for. Better late than never, right?! Susan — yes, these peaches are awesome! I always look forward to this time of year and Palisade peaches. I agree, it’s fun tasting local produce from different parts of the country. We all have our specialties! Chirstopher! Wow, what a nice surprise to find you here! I love it. It’s nice to finally have someone from my family stop by my blog — other than Tevis, of course. She doesn’t really count since we’re in this whole celiac/gluten intolerance thing together and I periodically “make” her leave me comments. I thought you were still walking! Great posts and photos thankyou. Swiss chard is a real favourite of mine and I love the different coloured chards avaliable. They look stunning in the garden.